Swimming lessons for all ages and abilities - Our pool is situated within the beautiful grounds of West Buckland School, a school which Olympic and World Champion Jonathon Edwards attended. The pool is 25m, has four lanes and is heated. The depth starts at 0.9m and slowly increases to 1.8m, there are steps at both ends allowing safe entry. There is a good designated seating area for spectators, changing rooms, toilets and showers. 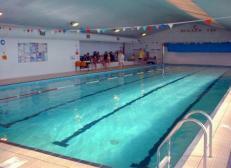 At this pool we teach all ages and all abilities to swim and to be safe in the water. We follow the STA Awards Scheme which is a journey through Aquatics focusing on fundamentals. If the parent and child wish, we will also test for other awards like personal survival, diving, cub and brownie badges etc. Each course is 12 weeks long and only runs in school term time. In the summer holidays we do offer crash courses of 1 hour a day for 3 consecutive days. The Double Nappy system is compulsory for all non-potty trained children at this pool. Each course costs £90.00 and can be payable in full, 2 or monthly instalments via direct debit. For more information please click on our FAQs page.